During a recent survey by Which? 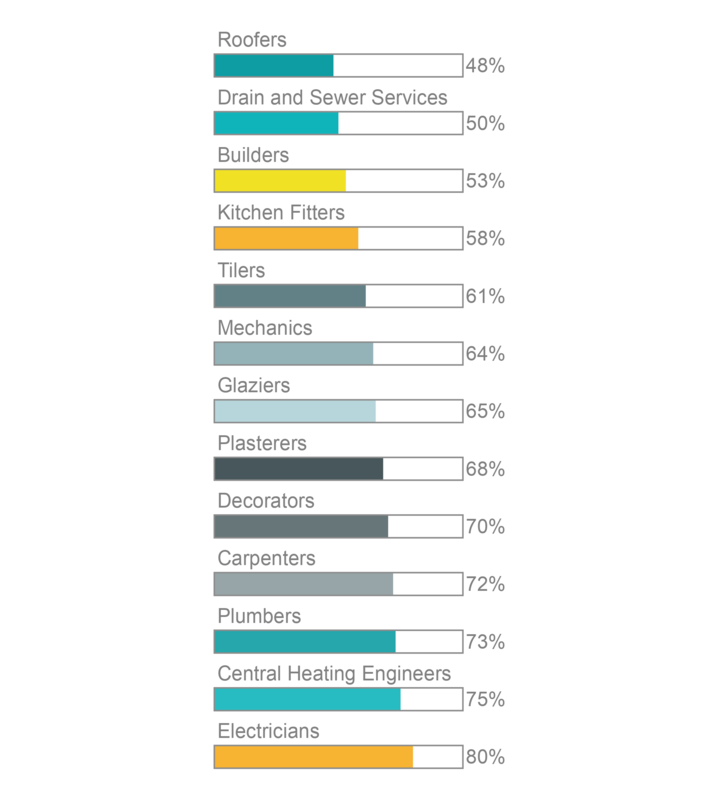 of almost 1,500 people, 80% said they trust electricians the most to improve their home and make repairs. Meanwhile, only 48% said they trusted roofers and 53% said they trusted builders. Finding the right tradesperson for the job can be time consuming and stressful, but the worries don’t stop once you have hired a tradesperson. Over 60% of homeowners expressed their biggest worry to be tradespeople not turning up on time, followed by 55% worried that the tradesperson would carry out a poor standard of work in their home, and 46% were worried about being ripped off. Among the least trusted trades were mechanics (27%), roofers (48%), drain and sewer specialists (50%), builders (53%) and kitchen fitters (58%). Electricians (80%), central heating engineers (75%), plumbers (73%) and carpenters (72%) rank among the most trustworthy. When it comes to hiring a roofer or builder for the first time, 4 in 10 of those surveyed said they would not trust them. A previous survey found that more than three quarters of the public are nervous about using a tradesperson for the first time, with nearly 4 in 10 having already had a bad experience with a trader. Which? suggest the reason for the high level of mistrust amongst the public could be the lack of regulations around certain trades, such as roofers, kitchen fitters and builders. Whereas, electricians, central heating engineers and plumbers have much stricter regulations to follow and regulated scheme associations, such as Part P Scheme Providers (like NICEIC) and the Gas Safe Register. Another reason for mistrust for certain trades could also be the scale of some jobs needing completed, like a new kitchen, and the pressure it puts on the homeowner to find the right tradesperson for the job, but also the worry of hiring a rogue trader at the same time. Last year, homeowners lost at least £6.6 billion to rogue traders and they lose even more to have that work corrected, so it is no surprise that this is a key worry for many when hiring a trustworthy tradesperson. Seek word of mouth recommendations from friends, family and neighbours who have had work carried out their home and experienced firsthand the standard of work from that tradesperson. If you don’t know anyone who has had work carried out in their home previously, look on trade review websites, such as Trustmark, Trustatrader and Checkatrade for company reviews. However, be aware of rogue traders lurking on these sites with false reviews and accreditations. Always do your research on the tradesperson – if they say they are registered with a trade scheme association, such as Gas Safe or the NICEIC, then double check their company name on those respective websites. If possible, ask for references from the tradesperson to discuss their work with some of their previous customers. Remember, a good tradesperson won’t mind showing off their previous work. When agreeing work, don’t give a tradesperson cash up front. A reputable trader should agree to payments in instalments once work has begun. Make sure you include a payment schedule within the agreed contract for work. For any gas work you are having carried out, to be on the safe side of things, hire a Gas Safe registered installer. This will ensure that they have the correct qualifications and have passed an on site assessment to show they are competent and safe to work in your home. 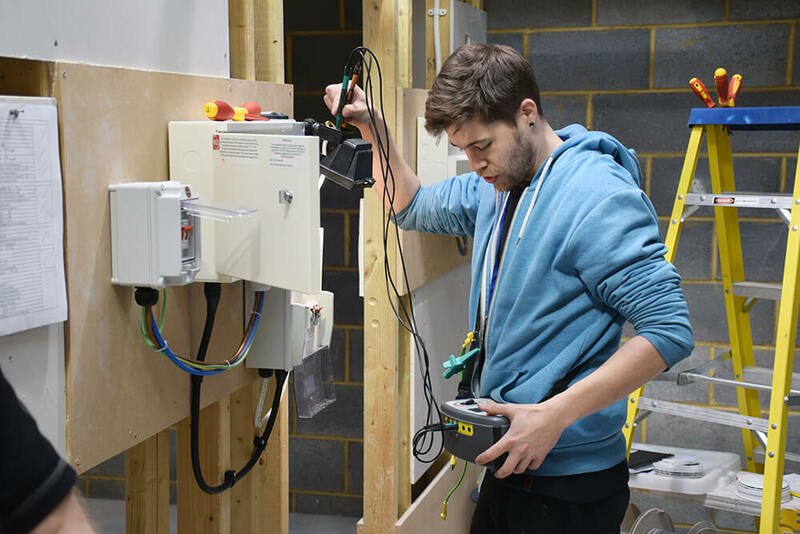 If it is electrical work you are having carried out, it’s safer to choose a registered electrician for the job as they will be able to sign off all of their own domestic work, including new circuits and existing circuits. If you are not sure if your electrician is registered, then go to the Electrical Competent Person Register to find out. Simply search for the company name and if they are registered with any of the Part P Scheme Providers (like NICEIC), their company name will appear in the results. If they are not registered with a scheme, don’t panic right away! Being registered with a scheme means they can sign off notifiable work, such as house rewires, consumer unit changes and new circuits. If they aren’t registered, but are still competent and qualified, the tradesperson will still be able to carry out minor works, such as alterations and modifications to existing circuits. To find out more and see where your work sits in all of this, read our guide to Part P of the Building Regulations. If you think you have a rogue trader on your hands, then take a look at our guide to rogue traders.